sandwich | This Girl’s Gotta Eat! My Orlando pretzel bun recipe adventure continues with this beautiful grilled chicken sandwich, featuring their Pretzel Hamburger Bun! I think this is pretty original if I do say so myself! The idea for this sandwich came together based on ingredients that I had and wanted to use up. I made the black raspberry syrup for brunch one Saturday after getting some gorgeous berries from Fresh Fork Market. I served the syrup on top of baked whole wheat pancakes which was absolutely delicious. I saved the leftover syrup, and waited for an idea to ferment. And of course, it did. 1/2 cup black raspberry simple syrup, you could also use any other jam or preserves you have – see below on how to make the syrup. For the syrup you’ll need 1 pint berries, 1/2 cup water and sugar as well as the zest of 1 orange. To make the black raspberry simple syrup, combine 1/2 cup water and a 1/2 cup sugar in a small saucepan. Heat over medium, cooking and stirring until all the sugar is dissolved. Add a pint of black raspberries (you could also use blueberries instead) and the zest of 1 orange. Bring to a boil, reduce heat to low and cook until berries start to thicken, about 15-20 minutes. Make sure to stir frequently. Remove from heat and cool slightly. Using a strainer, strain the sauce into a jar, pushing liquid through with the back of a spoon (this will catch any seeds). 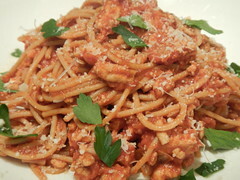 Reserve 1/2 cup of the syrup for this meal, and store the rest in a tightly covered jar in the fridge. Use leftover syrup on waffles or pancakes – its delicious! For the black raspberry-chipotle sauce, combine the 1/2 cup black raspberry syrup and the chipotle in a small saucepan. Bring to a simmer. Season with a pinch of salt. 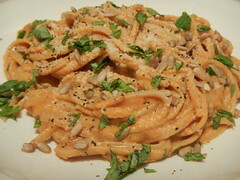 Use an immersion blender or a small food processor to puree the sauce until smooth, and set aside. Drizzle chicken breasts with a little olive oil and season with salt and pepper to taste, as well as a dusting of chipotle chile pepper. Grill on high heat until cooked through and juices run clear, 6-8 minutes per side. 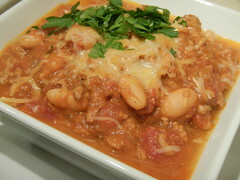 Remove chicken and top with a little of the sauce and sliced brie (use as much cheese as you like). Tent with foil to rest. This will also help the cheese melt. 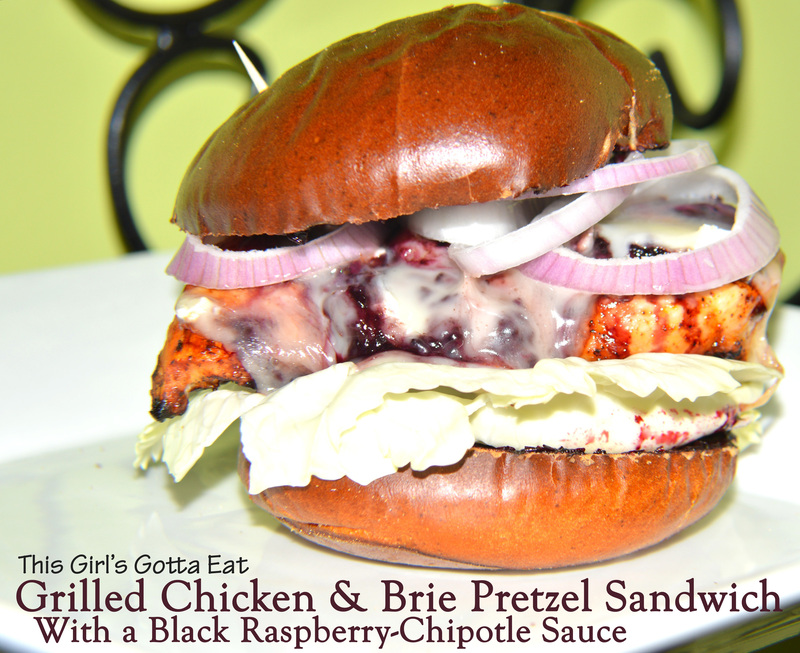 Spread some of the black raspberry -chipotle sauce on the bottom and top of the pretzel buns. Add a few cabbage or lettuce leaves on top of the bottom bun. Next, add a piece of chicken that has the melted brie on it, next add the shallots and finish with the top of the pretzel bun. Add a toothpick to keep the sandwich together if needed. This is a messy sandwich, so grab some napkins and just enjoy it! I recommend washing this deliciousness down with a Wild Blue beer! The French have a classic ham and cheese sandwich with bechamel called the croque monsieur….and when they add a fried egg on top, they call it a croque madame. I read somewhere it’s because the fried egg resembles a hat – I love that! I’ve been on a blogger review panel for Orlando Baking Company, testing their True Grains breads (see the bottom of this post for other recipes). Their Seed’licious is the final of the three sample breads I received to try, and is my favorite. This bread is coated with millet, as well as flax, sunflower and chia seeds, which not only provides a good source of fiber and protein, it also promotes digestive health. And better yet, this bread offers a nice crunchy texture. A perfect vehicle for a fancy, but healthy grilled ham and cheese! This madame tips her hat to you, Orlando Baking Company! Spray a large skillet with non-stick spray and heat over medium. Build your sandwiches…spread a little mustard on a slice of bread and add a slice of cheese and then a layer of ham (I used two pieces of prosciutto per sandwich). Spread a little more mustard on a second piece of bread and top the sandwich (mustard-side on top of the ham). Brush some olive oil on the top of the bread and place the olive-oil coated side down in your warmed skillet. While the sandwich starts to cook, brush the other piece of bread (now facing up in your pan) with a little more olive oil. Cook until the bottom turns a nice golden brown, then flip and cook the other side until golden brown. Remove from heat and transfer to the oven to keep warm. 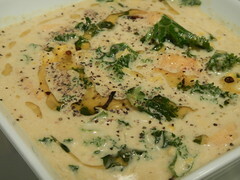 Meanwhile, heat the leftover pesto-bechamel sauce in a small saucepan over medium-low heat, stirring often until hot. Spray a little more non-stick spray in the skillet you just used and heat over medium-high. Add eggs (one egg per sandwich) and season with salt and pepper . Fry (untouched) until egg whites set and yolks are still a little runny. 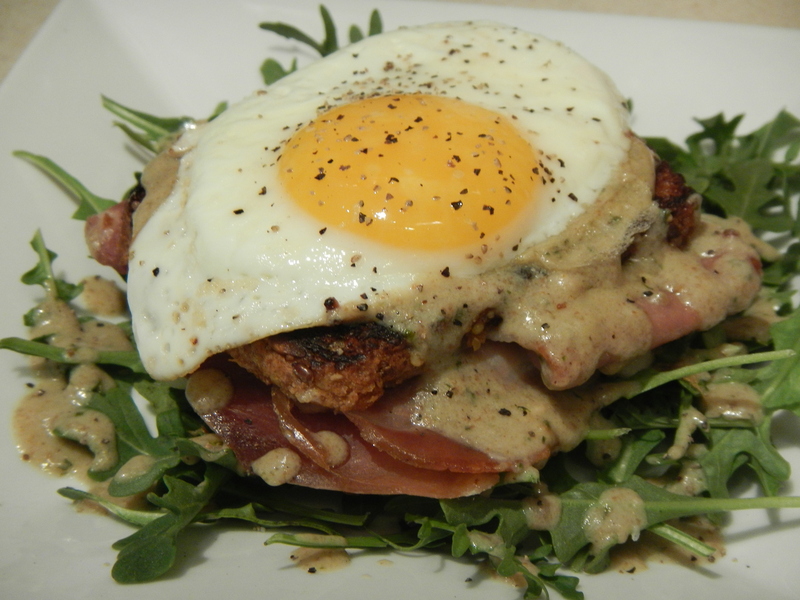 To serve, place a little arugula on the bottom of a plate, top with one sandwich, drizzle with the hot pesto-bechamel sauce and top with a fried egg. 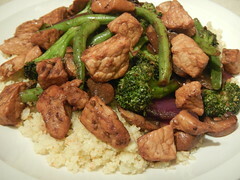 Categories : Entice, Pork, This girl has recipes! 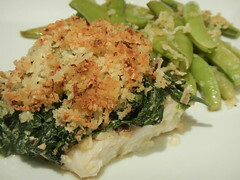 To make the dressing, combine the packet of Good Seasons with the vinegar and oil. The easiest way is to use a Good Seasons dressing bottle (sold in grocery stores by the seasoning in the salad dressing aisle) which has the measurement lines on the outside – pour the vinegar, oil and water in where the lines tell you too, close the lid and shake! 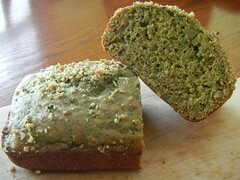 I use two different loaves of bread so I can offer a healthy option on the multi-grain bread to those that want it. If you follow my lead and go with one of each too, then build one loaf at a time. Slice the french loaf in half so you have one large top and one large bottom. Set the top aside. On the bottom part, spread a layer of cream cheese on the bread using a knife. You can use as much or little as you like, however it’ll taste better if the bread is fully covered. Next, add a layer of the sliced red onion and a layer of lettuce. On top of the lettuce you’ll add a layer of each of the meats…turkey, ham and salami. Add a layer of provolone on top of the meat. Finally, give the dressing you made a good shake and drizzle it on the top side of the bread that you had previously set aside. Use a pastry brush to evenly distribute the dressing – you want enough to coat the bread, but not too much that the bread is saturated (you should have leftover dressing even after using it on two loaves). Place the dressing top part on top of the bread on the rest of the sandwich and cut into single portions. 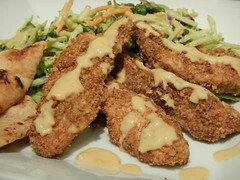 Secure each portion with a toothpick. Repeat steps with the other loaf of bread if using. Food Network Magazine had some fun spins on the classic ice cream sandwich, including these coffee and doughnut beauties! I brought these to a Memorial Day cookout for dessert on a hot day and they were a BIG hit….super easy and super cool! To build: split chocolate-covered doughnuts in half crosswise. 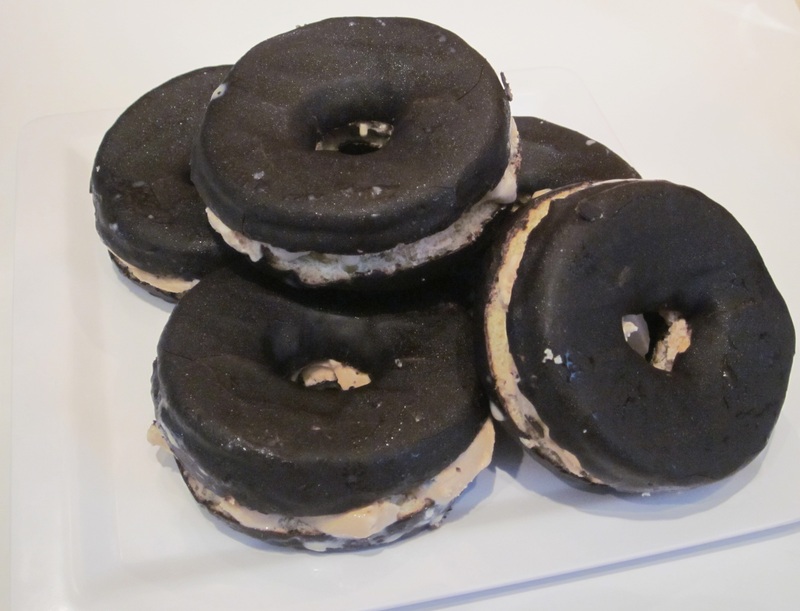 Sandwich with coffee ice cream, arranging small spoonfuls on the doughnut ring keeping the hole empty. Chill the doughnuts in the fridge before splitting in half, makes for an easier cut. After you split the doughnuts, freeze them for an hour or two before assembling. Use firm ice cream, not softened. Scrape the ice cream instead of scooping. After assembling, freeze sandwiches at least 1 hour before serving. 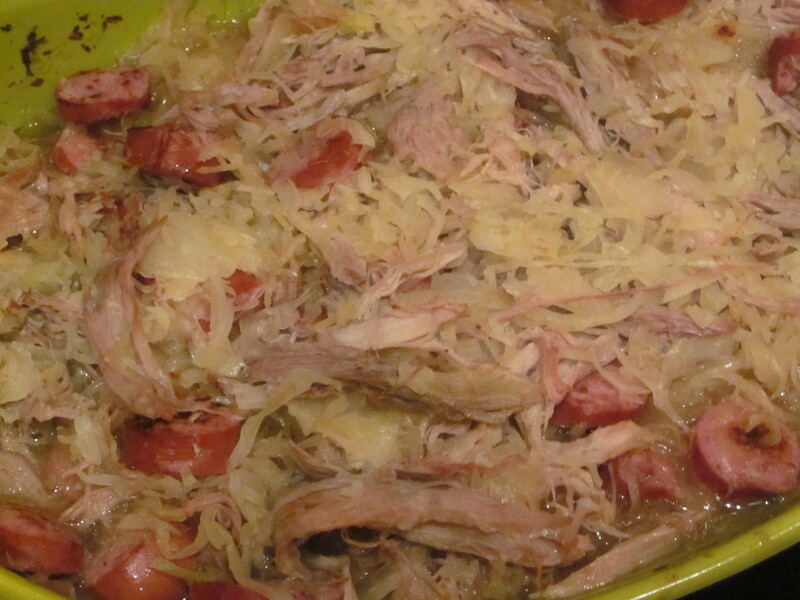 Pork roast with sauerkraut and kielbasa on New Years Day is a German tradition I grew up with thanks to my Grandparents, and continues in my own home today. Of course I didn’t always enjoy eating the sauerkraut, but my “Grammy” forced us to eat at least a strand or 2 for good luck….guess it just grows on you over the years. She would melt if she saw me making it on my own these days! Add the pork roast to a crock pot and cover the pork with chicken broth. Next add 2 onions, halved. Cook covered on low for 6-8 hours. You want the pork to be tender and to easily fall apart, that’s how you’ll know it’s done. Remove the meat, tent with foil on a plate or cutting board and rest for 10 minutes. Preheat your oven to 400 degrees. At the same time, cut your kielbasa into 1-2 inch pieces and saute in a skillet until slight brown on both sides. 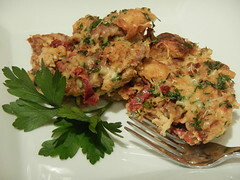 Add your sauerkraut to a medium-sized casserole dish, sprinkle with brown sugar and mix together. The brown sugar will help cut the acidity. Next add your sautéed kielbasa. By this time your pork should have had enough time to rest. Start to pull the pork in pieces using two forks, adding it to the kraut. Reserve some of the pork for the following BBQ pulled pork sandwiches, store in an air tight container in the fridge until ready to use. Cover the kruat, pork and kielbasa with foil and bake for about 30-45 minutes. This will cook the sauerkraut and help the flavors to combine. Add your reserved pulled pork to a medium saucepan along with some chicken broth (enough to re-moisten the pork, about 1/2 – 3/4 cup), cook on low heat, stirring occasionally until nearly all the chicken broth is gone. This is my trick for keeping the pork tender and juicy. Next add the BBQ sauce to the pork and cook until headed through, about 5 minutes or so. 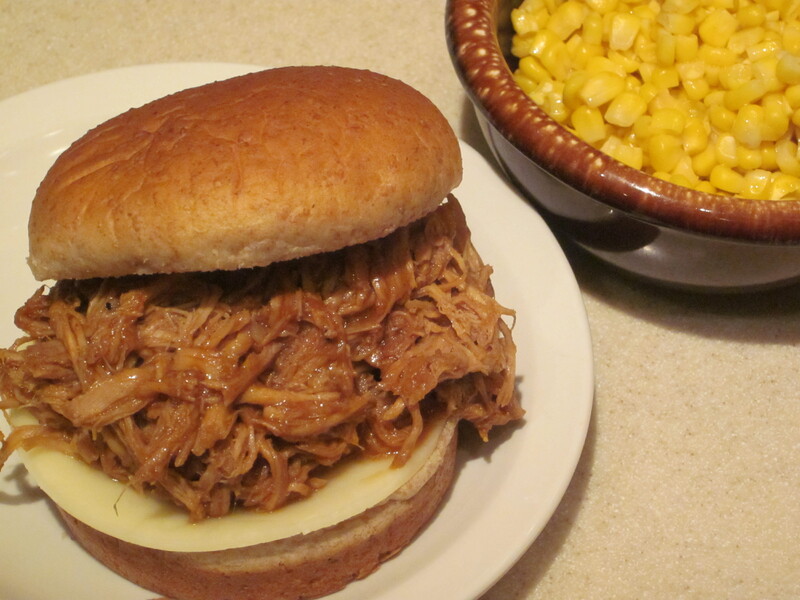 Serve on buns with extra BBQ sauce and a slice of cheese like provolone if you’d like…it’s that simple! 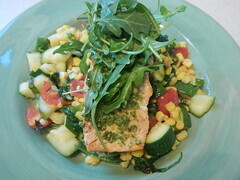 I served this with a side of corn and a small salad to round out the meal. We’re gearing up for an all-day volleyball tournament, and on the to-do list…food! Sandwiches are such an easy go-to for an outdoor all-day event, but I wanted to whip up a sandwich with flair that echoed the personalities of our saucy team! 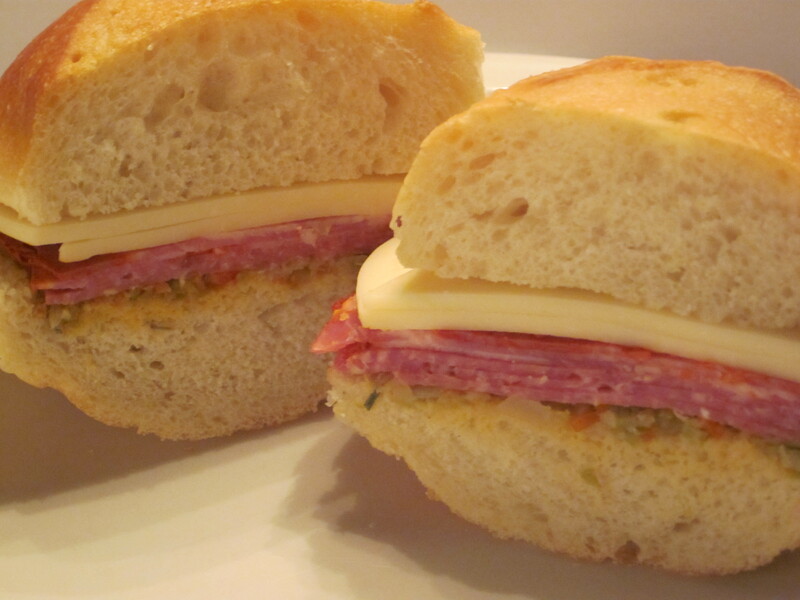 Rachel Ray had a perfect fit….Muffuletta, a classic New Orleans sandwich but with a little Rachel twist. Traditionally, this sandwich is served heaping with the pepper and olive salad. But as you’ll see from the pic, I toned it down since I made these the night before and they need to travel. 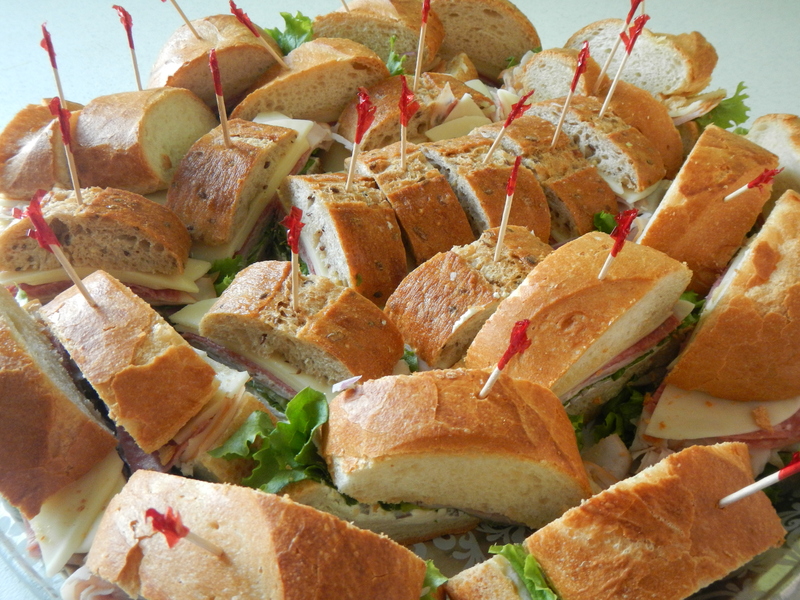 Either way, piled high or low, Muffuletta is delicious! Chop pepper salad or giardiniera in a food processor with olives. Split bread and drizzle with oil and sprinkle with rosemary (This Girl tip: if you’re preparing ahead of time, omit the oil). Spread the olive salad on the bottom of the bread very liberally. Pile on the meats on top of the olive salad, then layer cheese over meat and cover with bread top. Press down to set the sandwich, then cut.